Summary of today’s show: There are more than 25 different ethnic communities spread across 75 parishes in the Archdiocese of Boston, representing the breadth and diversity of the Catholic Church throughout the world, served by the Office of Cultural Diversity and Outreach. Scot Landry and Fr. Chris O’Connor talk with Fr. Mike Harrington, director of the office, and Natalia Perdomo and Kateri Thekaekara, members of the office’s young adult council about their experiences of their faith as an immigrant or the child of immigrants as well as the upcoming Catholic Family Festival that will showcase the unity and diversity of the Church in the Archdiocese. 1st segment: Scot Landry and Fr. Chris O’Connor discussed the “eschatological barbecue and bocce tournament” to mark the end of the St. John Seminary school year. Fr. Chris said the “evil empire” trio of seminarians who have been winning over and over were defeated in the tournament. Fr. Chris said the Master of Arts in Ministry commencement and Mass are the next big events for the eight graduating this year. He said Cardinal Sean will be there for the ceremony on Wednesday. Scot talked about his past weekend in which he took part in a training called Catholic Voices, which prepared laypeople for being in the media. He said it was great to hear professionals teach how to respond to hostile questions. 2nd segment: Fr. Mike Harrington described the Office of Cultural Diversity’s work. They act as liaison to the more than 25 different ethnic communities found in 75 parishes in the Archdiocese of Boston. Scot said many of the people that Fr. Mike’s office serves will be the future lay leaders of the Archdiocese of Boston. Fr. Mike said they serve many immigrants who find their home in the Catholic Church of their faith. They feel a call to help the communities to realize that they are part of the mission of the Archdiocese. Fr. Mike said as he experienced the communities, he was surprised by the size of the communities, how packed the churches were, and how many young people were present. At one event, more than 100 Korean young adults showed up. Fr. Chris said Cardinal Sean recently noted during Lent how many converts to the Church were Korean. Fr. Chris added that there were several Korean seminarians as well. Fr. Chris said they don’t just minister to those who speak other languages, but they also minister to the deaf apostolate and black Catholic ministries. Scot listed all the countries of origin of the various ethnic communities served by the Office of Cultural Diversity. Fr. Mike said they have started a young adult cultural diversity council and an ethnic council. That is made up of two members from each of the ethnic communities. Fr. Mike said many of these people have known priests and others who have been martyred. Scot asked Kateri about the young adult council. She said mentioned the people she’s got to know on the council. Fr. Chris asked about their work and Kateri said they’re planning a music night to share their talents and helping prepare for the family festival. Natalia said the council started about two years ago. She’s a member of Sacred Heart Parish in Newton, which is her immediate family, and the young adult council is her extended family. She said she was born in Bogota, Colombia. She’s 20 years old and they moved her 14 years ago. She attended Montrose School in Medfield and is now a junior at Franciscan University of Steubenville. She hopes to counsel young adults struggling with addictions. Kateri said he father is from India and her mom is from Slovakia. They met at St. Anthony’s Shrine in downtown Boston. Her mom was a refugee and her dad was studying music. They had eight kids. She’s attending College of the Holy Cross and will be a junior next year majoring in music and physics. Her father is Catholic and is from Kerala in southern India. Fr. Chris said a recent issue of National Geographic discussed how the apostles spread throughout the world, including St. Thomas to southern India. Kateri said the fact her parents are from different continents and yet strong in their faith strengthens her own faith to make it her own. Natalia talked about her family coming from a majority Catholic country and how her mom has a strong devotion to Mary. She grew up praying the Rosary daily with her family. They had a particular devotion to Our Lady of Fatima. Kateri talked about the Indian Syro-Malabar rite Catholics in the area and while they took part in that for a few years, because of her mom’s Slovakian background, they’ve become more involved in their own parish. Fr. Mike talked about his different experiences of the ethnic communities, including a Brazilian summer pilgrimage, where he saw so many gifts among the young adults. Fr. Chris asked what expressions of faith Fr. Mike said seen that affects his faith life. Fr/ Mike said it’s the way they worship, how strong their faith is despite challenges and persecutions in their pasts. He noted that African Catholics often worship at Mass for more than 2 hours each Sunday. Kateri said she majored in music because she knows she will be involved in cantering in church all her life. As a cantor, her singing can reach the hearts of those in the pews. Her favorite song to sing is Matt Maher’s “Jesus is My Everything”. Natalia said her favorite church song is “Lead me to the Cross”. Scot asked how they would respond to those who don’t sing. Kateri said in ethnic communities people sing with their whole hearts. We sing to praise God with our whole selves. Kateri described visiting India. the church is packed every Sunday, everyone gets there early, and they are very focused. Indian Masses are very long, she said. 3rd segment: Scot began the segment by talking about Kateri’s unusual name. Fr. Mike told the story of how he first encountered Kateri’s whole name. The Catholic Family Festival is June 23 at Boston College High School. Fr. Mike said the event’s origins are in a family conference that talked about elements of the faith. Last year, as he got to know the ethnic communities, they wanted to get more involved and it became more of a family festival. He said last year they packed Malden Catholic High with over 1,400 attendees. They hoping to get even more this year. This is for everyone, not just for members of ethnic communities. 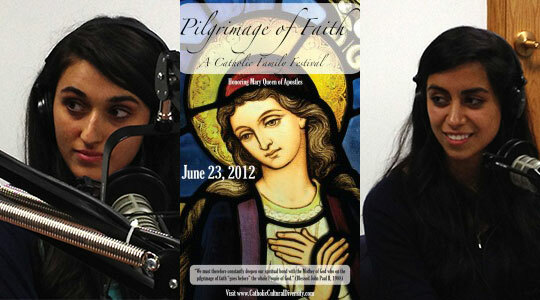 Natalia said he was remembers Cardinal Seán’s homily last year on re-kindling the fire of faith through the Eucharist. Kateri said members of the young adult council were cantering for the Mass and they sang “We are One Body.” She was amazed to see how powerful it was for the people attending the Mass. Fr. Mike said everyone at the Mass was given a flag representing their country and during the procession it was like a mini-World Youth Day. Natalia said it was great to see the universality of the Church. Fr. Mike said Eucharistic adoration will take place all day in the chapel. There will also be a cultural gala of 20 different dance and music groups from ethnic communities, expressing honor for Mary, Queen of Apostles. Fr. Chris noted that there is an international food festival.they discussed their favorite dishes from last year. Fr. Mike said he particularly loves desserts and he recalls some great Middle Eastern desserts. Fr. Mike said there will be an area for activities and events for young kids of various ages. They will also have some blow-up bouncy games for kids. Of course, the music and dances will be there as well. They are also constructing shrines from each community that are devoted to a particular shrine to Mary in their home countries. Scot said it recalls for him visiting the Basilica of the National Shrine of the Immaculate Conception. Last year, they honored Pope John Paul II after his beatification. This year, they realized what everyone had in common was devotion to the Blessed Mother. He came across a quote of Pope John Paul II about deepening our bond with Mary who on the pilgrimage of faith goes before the whole people of God. This made Fr. Mike think of Pope Benedict’s Year of Faith which begins in October of this year. Fr. Mike emphasized that this is a free festival. They didn’t want to make any barrier to people coming. You can register at their website. Fr. Mike gave a list of reasons for people to attend the festival: Experience the universality of the Church; attend Mass with Cardinal Sean and maybe receive an apostolic blessing; come to experience diversity of our faith; come to meet your brothers and sisters; families come together as one family of faith; it’s a free event; experience traditional Mass and devotions; live music; networking; good food; and more. Natalia said Catholic young adults should come as a response to the attack on the family in our culture.